Would you like to create your city-wide Wi-Fi hotspot without investment nor public funding? In Turku, Finland, in one month time, a city-wide Wi-Fi network of hotspots has been created with absolutely no centralized investment or public funding. Creating cooperative grassroots wi-fi networks is now within our reach without the need to get state or city funds involved. As we increasingly have extra bandwidth available to our offices and homes, it is only intelligent of us to use this extra capacity for our own good. The basic idea here is that people themselves agree to share in a cooperative fashion their extra broadband connection capacity, in exchange for receiving free access to other community members access points when roaming around the city. SparkNet and OpenSpark are two similar projects that have been carried out in Turku Finland, and which utilize a specific combination of low-cost/free software/hardware tools to leverage community members' Internet extra capacity. SparkNet is an active partnership between public sector organizations and private companies. 1. Participating institutions (both public and private companies) have created a VLAN (separated from their backbone network). This is a rather easy task which requires only a few minutes at each participating end. To be noted the fact that the SparkNet VLAN is created so that it sits outside of any of the participating institutions firewalls. Founding members of the SparkNet VLAN include the University of Turku, �...ba Akademi University, Turku School of Economics and Business Administration, Turku Polytechnic, ICT Turku Ltd and MP-MasterPlanet Ltd.
2. The individual VLANs where interconnected with each other (this requires some Unix servers were acquired). 3. Every participating institution acquired a number of physical access points costing under 100 EU each. 4. A multioperator network management system was deployed - in this case they chose StockholmOpen (open source). This setup enables all institutions involved to use their own Internet gateway (e.g. wherever a university student uses this network his/her connection will go through his/her University's internet gateway). 5. More parties were linked to SparkNet with a roaming type arrangement: private companies, municipalities etc. As a result of this, all students in Turku (over 50.000) can use the SparkNet Wi-Fi network free of charge all over the city. and over 500 access points. It is also the most used Wi-Fi network in Finland. But also private companies or even individual home users can all contribute to creating this type of co-op Wi-Fi. With this in mind, a home user community network, called OpenSpark, has also been started. In OpenSpark anyone can share his own broadband connection with others wirelessly. With OpenSpark already 600 access points have been acquired and more are being ordered. "Can this be done here in Rome? ", I asked Jaakko Kuosmanen, Managing Director of ICT Turku Ltd.
"SparkNet is a concept which can be deployed in Rome as in any world city reached by the Internet. As long as there is an Internet connection and desire friom a sufficient number of parties to co-operate SparkNet can be deployed just about anywhere. The key critical factor is the willingness to co-operate." What it needs to take place is for some institutions, and here these could the University of Rome, the City of Rome and maybe even the Vatican could chip in this very altruistic and co-operative effort that would allow a large part of the city to become a community-supported giant Wi-Fi spot. OpenSpark is basically a voluntary co-op Wi-Fi. Both OpenSpark and SparkNet can be operated and installed in any home or office having a broadband connection to the Internet. Any ADSL or better type of connection will do. What is also needed is a so-called access point. Jaakko Kuosmanen, uses and recommends a Buffalo WBR2 access point, though there is going to be an increasing number of units that would do equally well. Once the freely downloadable OpenSpark software has been installed into the access point you are ready to register into the OpenSpark community through a user ID and password that will be issued to you. Now you can access your own Internet connection wirelessly, both from your house/office but also from anywhere in your city where other OpenSpark users are located by using your new OpenSpark user id. You only get one user ID for each access point you register and if you ever disconnect your access point from the Internet (for any serious amount of time) your user ID gets deactivated automatically. You can also create local user ids for your family to use. Now, when moving around the city you can connect to the Internet wherever there is someone's OpenSpark access point. You can use other community members access points as they are free to use your own. There are already a few other existing co-op Wi-Fi networks, using other tools and technical solutions around the world but according to my source they are not as easy to set-up and do not have a unique software like OpenSpark which supports the above kind of community building. The city of Turku in Finland, where Jaako is based, has already acquired some 500 access points (apx cost: 40.000 EU) and it has given them to its own citizens for them to connect up to the Wi-Fi co-op network. Yes, you have read it right: the city subsidizes the purchase of the hardware access points that it then freely distributes to its own citizens in order to create a grassroots city-wide Wi-Fi network. Today SparkNet has now some 600 access points in Turku and OpenSpark network only 50, but as mentioned above, the city of Turku has acquired 500 access points and is distributing these to citizens so they can connect them to OpenSpark. See SparkNet map. Again, both SparkNet and OpenSpark are global concepts that can be deployed anywhere. There is in fact already one OpenSpark access point in Manhattan, New York and more are soon expected to pop up in other locations. Since individuals only need a broadband connection, free software and a $ 130 access point hardware device, how can you and I do anything to make this become a reality in our own neighborhoods? Reference presentation delivered at Gartner Group's Mobile & Wireless Summit last month in London. "The City of Turku has invested strongly in developing Turku Science Park as an innovative environment that represents the co-operation between universities and business life as well as the synergy between companies. Development work has been done for a long time in the region, seeing as the Turku Technology Centre started up in the 1980s, and there are now a significant number of organisations that specialise in promoting business in the region. The implementation of the Turku Science Park strategy began in summer 2001, when the City of Turku founded Turku Science Park Ltd. and ICT Turku Ltd. The goal of the Turku Science Park group is to develop Southwest Finland's innovative environment in close co-operation with universities and companies." 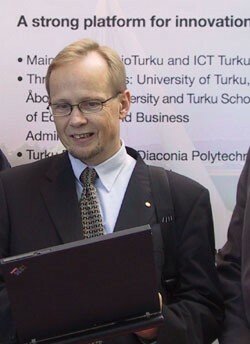 Jaakko Kuosmanen is Managing Director of ICT Turku Ltd.
ICT Turku and BioTurku are part of Turku Science Park.